Wade Deacon High School is a coeducational secondary school part of the Wade Deacon multi-academy Trust, located in Cheshire, England. We wanted to find a way to manage the technology in our classrooms, deliver remote support and look at what students are doing on their computers. The software is very easy to use and the features met our needs to help manage technology in the classroom with ease. When using it, we found all of the options are in logical places, making it simple but effective. The product was also recommend by another school who uses it. 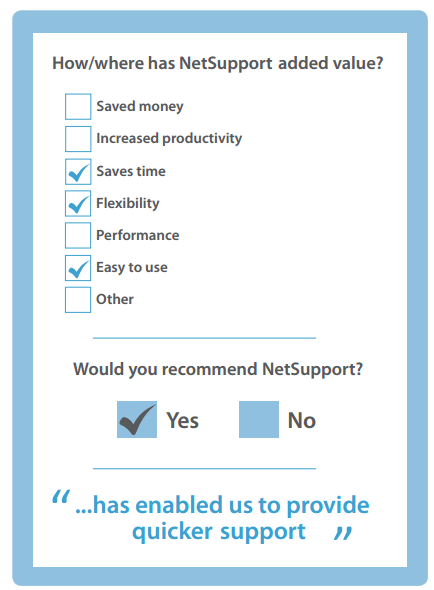 NetSupport School (798 licences) is being used in the ICT suites and on the departmental laptops to monitor and support the students while in the classroom, using tools such as screen monitoring, chat functions, blocking mode and much more. The remote support console has enabled us to provide quicker support to users. It is a very good product and does what it says.